Doctor Who: THE RETURN OF DOCTOR MYSTERIO Review | Warped Factor - Words in the Key of Geek. Moffat In Kickass Capaldi Christmas Shock. The Return of Doctor Mysterio is on the one hand not remotely Christmassy beyond the pre-credits sequence. But on the other hand, it’s the kind of episode you couldn’t really justify on any occasion other than Christmas, because Christmas episodes have to be predominantly for family audiences, rather than necessarily main run Doctor Who audiences. They have to be heavy on fun, heavy on believable danger, and have a threat level which is both grand and yet not universe-threatening. They’ve been highly varied in the past, but this episode also pulls off another odd balancing act – as well as being a non-Christmassy quintessential Christmas episode, it’s both entirely family-accessible, while at the same time being written by a geek, for geeks, as a love letter to that most geeky of geek art-forms, the comic-book. Four big ticks right off the bat, then. Quintessential Christmas episode, no forced Christmassy snowflakiness, geek-heavy and yet family-accessible. If it managed to do just those four things, The Return of Doctor Mysterio would have knocked its responsibilities out of the park. It does those four things before the credits even roll, so we’re in for a roller-coaster ride of Christmas coolness. The idea of the Doctor being inadvertently responsible for the creation of a Proper Comic-Book Superhero, protecting New York, while living a double life and pining after the girl he wishes had been his high school sweetheart works well – it’s alien tech as superhero food, which is not a million miles away from a classic superhero backstory in the first place, but for the geeks in the audience, there’s an added bonus, in that Grant draws the energy for his superpowers from what is effectively ‘Earth’s yellow sun’ – a cute nod to the Superman origin story. The villains here are part classic superhero comic-book, part classic Doctor Who, and it’s a fusion that works in Steven Moffat’s script – brains that are actually sentient creatures in their own right and part of an intelligent plot to replace humanity has something of Superman’s ‘Hfuhruhurr’ enemy, and a large dose of any number of Doctor Who villains, from Daleks to the Brains of Morphotron in The Keys of Marinus to Arcturus in The Curse of Peladon to a host of others. The synthesis of the story elements is given a CGI helping hand with the brains growing eyes unexpectedly – an arrestingly creepy moment – and the idea of their human-suits being essentially little more than wallets for all the handy things they need to carry around, including guns. There’s a heaping helping of the Twelfth Doctor’s growing cynical, if honest, appraisal of humankind too – one day of terror and all the people are in a panic, as ‘the rich old men run to the safest place to hide, while they send their young people to die.’ Oof – heavy, harsh, and depressingly accurate social commentary over your turkey sandwiches, but as the world moves into a phase of idiocracy, it’s by no means unwelcome, acting as the sort of catharsis that the Seventh Doctor was in the days of Thatcher and Reagan – the Doctor is increasingly becoming again the voice of fictional, objective rebellion against humanity’s stupidity in choosing its leadership. Yes please, more of that. The storyline of the Ghost, and Grant’s love for Lucy Lombard (for which of course read Lois Lane) is absolutely standard comic-book superhero stuff from the pre-cynicism, pre-modernism era, and while in movies, superheroes have been getting darker for many a year, the success of DC villain-of-the-week fodder like The Flash and Supergirl in recent years suggests a return to palatability of such simple heroism. More to the point, while some may see the straightforwardness of the super-love story as being unchallenging, here it was interwoven with classic Doctor Who toing and froing, and there was enough realism in both Grant and Lucy’s characters to anchor it in modernity despite the simplicity of their goodness. For the geeks, and for families wanting a giggle, there were plenty of rational questions raised about superhero comics, questions every geek has at some point asked themselves, but brushed aside for the sake of drama – if Peter Parker was bitten by a radioactive spider, why didn’t he just get radiation sickness, lose his hair, throw up and die? If Superman’s got X-ray vision, how come he can not use it sometimes, and how the hell did he survive through puberty? How come every reader knows Clark Kent and Superman are the same person, but Lois Lane, who works with the one and loves the other, and is not a brain-dead moron, can’t quite figure it out because her colleague wears glasses? Funny stuff that hits harder on the funny bone for geeks, because it pretty much ‘belongs’ to us, and we’ve known it for years. Having it raised in Doctor Who allows us to chuckle at our own geeky love for stories like this. Matt Lucas as Nardole, one of the episode’s biggest question-marks going in, worked better than any of us had a right to expect based on his role in The Husbands of River Song, and importantly, his nature as an alien was firmly established. His flying the Tardis, having a few unscheduled stop-offs en route to rescue the Doctor (can we say ‘spin-off book, a la The Tales of Trenzalore, Melody Malone, Diaries of River Song etc’?) gave him a unique alien vibe that we hadn’t realised how much we’d missed till he showed it to us. There was a touch of (and here, feel free to wail in derision) Romana about his dialogue and his equality of interaction with the Doctor in this episode that absolutely acted as a screen-wipe of the Husbands nonsense and earned him our attention going forward. Most of all though, this felt like a Peter Capaldi Doctor growing more and more thoroughly into himself. After his series of immediate post-regenerative soul-searching about whether he was a good man or not, and his series of going too far to try and keep Clara Oswald safe, this feels like a Twelfth Doctor more secure in his nature. The dialogue given to Capaldi here, and his playing of it, feels both new and like coming home all at once, his talks with the young Grant given the time to breathe, his dialogue with Nardole somehow freer than it ever was with Clara, as though he doesn’t have to restrain himself for human comprehension any more, but can be as odd and incisive as he naturally is. The Nardole narration at the end, telling us that for a while the Doctor’s going to be sad, but that Nardole will be working to make sure he’s alright in the end, while a slightly crowbarred expectation-hook for Series 10, felt reasonably right – more or less denied the ability to mourn for Clara, he can mourn River instead, giving him an emotional journey on which to go, and a useful alien friend to help him through it. And finally, the peek we got of the ‘soft reboot’ that Series 10 has been marketed as looks like it continues this trend of the Doctor being more and more himself, free of existential demons, but learning it’s OK to have his own emotions while still being a universal hero. The introduction of Bill as a chip-server who learns to see the universe in a whole new light sounds like classic ‘start again from scratch’ Who that will bring us something new in the chemistry between the Doctor and his companions, and in the chunks of universal chicanery they have to fight. 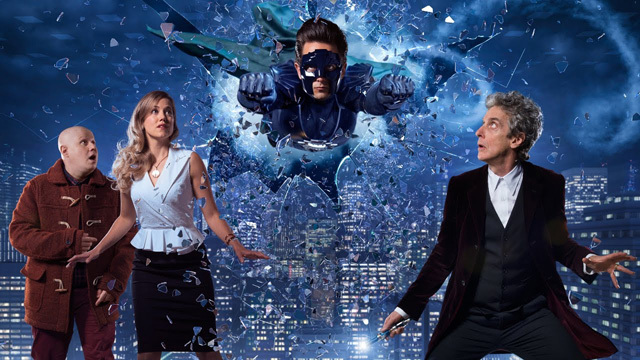 Beyond all the analysis and the geek-think, The Return of Doctor Mysterio was Christmas Special FUN, which is more than could be said for either of the previous two Capaldi Christmas Specials. In fact, for general audiences, it was probably the best, most engaging Christmas Special since at least The Time of The Doctor, without an over-forced Christmas reference or a stupid robot anywhere in sight. The Return of Doctor Mysterio – big ticks all the way down the list. The Return To Form of the Doctor Who Christmas Special? Yes, it was that too.